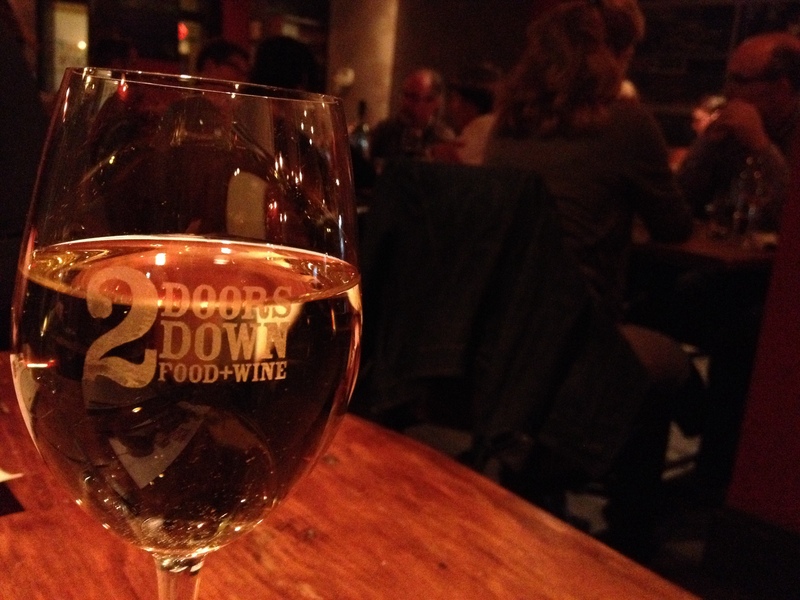 I finally had dinner at 2 Doors Down! For months, I have been peering longingly into the windows of the Barrington Street location two doors down (get it?) from its older sibling Chives and drooling over the menu online. So, when my dear friend and former classmate Erin came to town, I knew that 2 Doors Down was the perfect place to go for dinner, partly because I thought it would be a plethora of local and seasonal Nova Scotia fare, and partly because of my own selfish foodie desire to eat there. 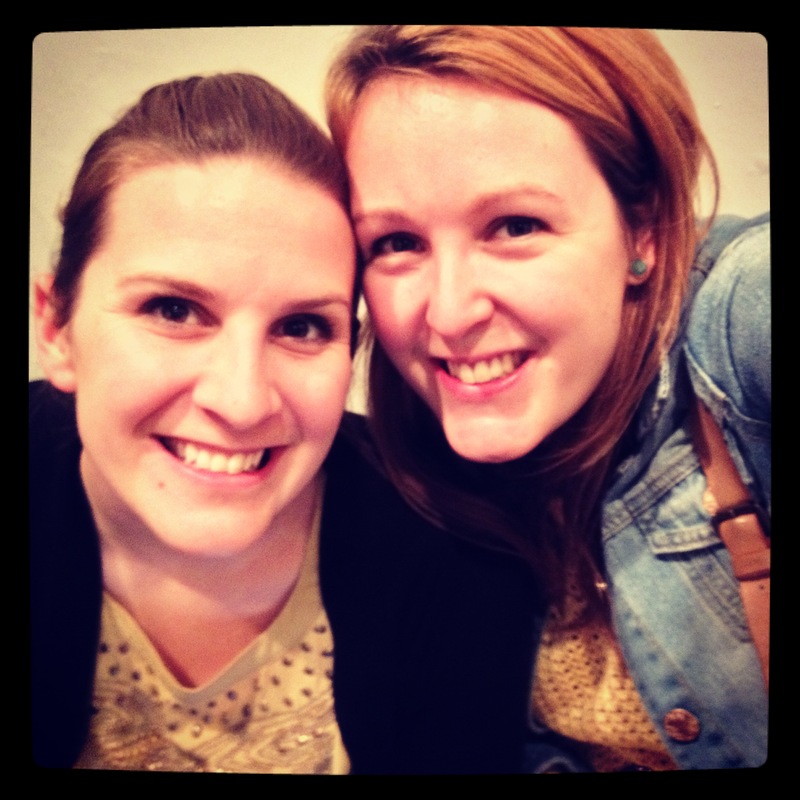 Erin is from Toronto and we bonded during our Masters program at the UofT. Her family is from Newfoundland and she loves to eat, so obviously we became besties pretty instantly. We spent a lot of our degree gabbing, eating, and drinking (and studying?). In fact, I talked about Erin and our favourite spot Cafe Le Gaffe in the post about my return trip to Toronto last year. Here we are having a blast at Nocturne a few weeks ago! Friday evening we cabbed down to 2 Doors Down, excited to eat, drink, and be merry. Obviously the restaurant was packed, and because they don’t take reservations I was a little worried that we wouldn’t get a table. The hostess greeted us immediately and informed us that it would be at least a twenty minute wait (not too bad for a Friday). We were instructed to saddle up to the bar and have a drink while we waited. The jovial and boisterous bartender, Steve, poured us generous glasses of wine and we perused the menu while we waited for a table. The decor of 2 Doors Down is awesome, it is modern and urban while at the same time comfortable and lived in. There is a great juxtaposition of the sleek modern surfaces of the concrete bar and metallic patterned wall paper with the country accents of the distressed wooden hostess stand and the planked wood tables. I love it. The red walls enrobe patrons in modern comfort and the dark lighting is perfect for a Friday evening. The place has great energy. To our surprise and delight we were seated after only ten minutes and we settled in with our drinks to order. Our server was super friendly, knowledgeable, and you could tell she loves the food. The menu is not divided by appetizer and entree, but in three separate sections: “Meat,” “Seafood,” and “Vegetable.” Within each of these categories are smaller plates to share or have as an appetizer and larger plates for full sized meal options. Though the menu may appear to be limited this way, there is actually a huge selection of items for any palate or dietary restriction, including a vegetarian Penne Carbonara! For appetizers, Erin and I chose to share two smaller plates. 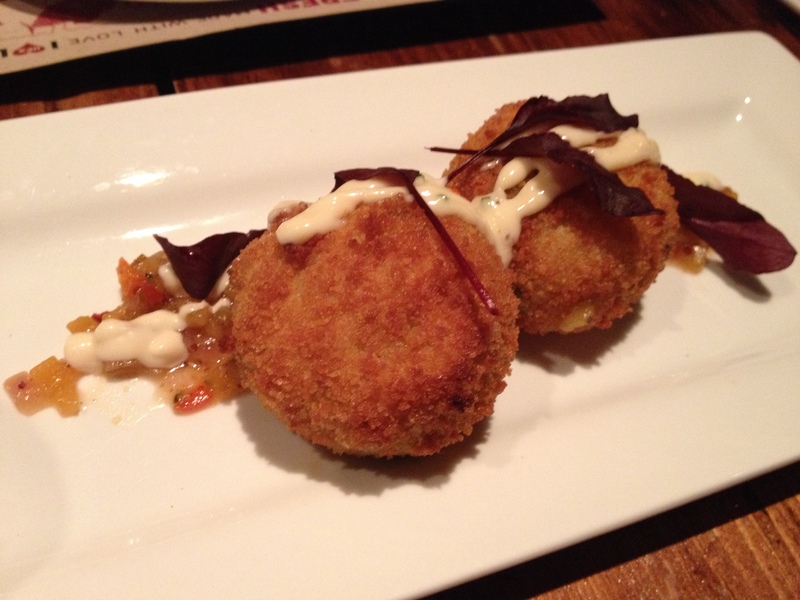 The first was the feature ‘bar snack’ for the evening: Autumn Veg and Goat Cheese Risotto Balls. They were freaking delicious. Cooked to a perfect crispy outside and a deliciously flavourful and ooey gooey inside. And, at 6$ for an appetizer, these were a steal of a deal. YUM! 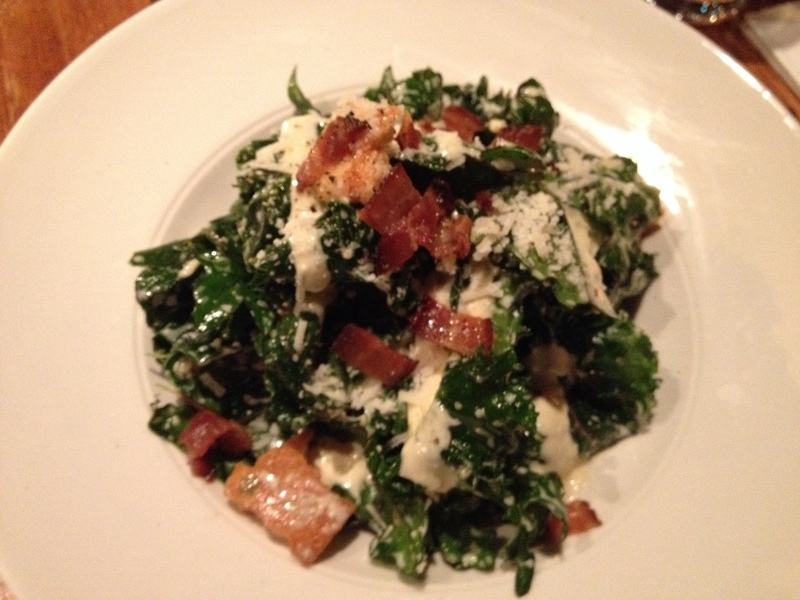 Our second starter was the Kale Caesar! Salad. I had to order this because I have been hearing lots of good things about this salad, and also because I love food puns. They crack me up, simply cannot resist a good food pun. Kale Caesar! Ha! I was not disappointed. I have to confess that I have yet to board the kale train that seems to be speeding down the tracks these days, but I have to say, this salad was great! The double smoked bacon and the gouda flakes were just amazing, and the garlic aioli dressing was so delicious it could have been tossed over shredded newspaper and I would have gobbled it up. Eat. This. Salad. 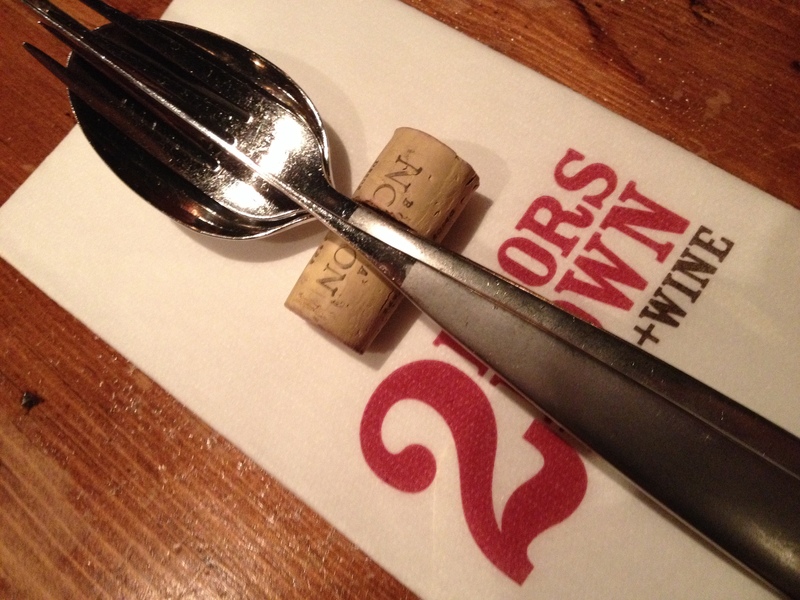 There is such great attention to detail at 2 Doors Down. From the etched stemware, to the pristine graphic tees of the cooly uniformed staff, to the corks balancing cutlery on logoed napkins, there was a lot of thought put into the execution of this restaurant’s design and its service. For instance, Erin wasn’t a fan of the second glass of wine that she chose, so the server swapped it out for something she liked more, no questions asked, no cost. That is great service. For the entree course Erin had a lot of trouble deciding what to order, so she chose to go with two small plates: the Farmer’s Market Soup and the Korean Pork Belly Slider. I’m aware that I go on and on about pork belly on this blog, but it has to be said that this little bundle of joy was yummy. 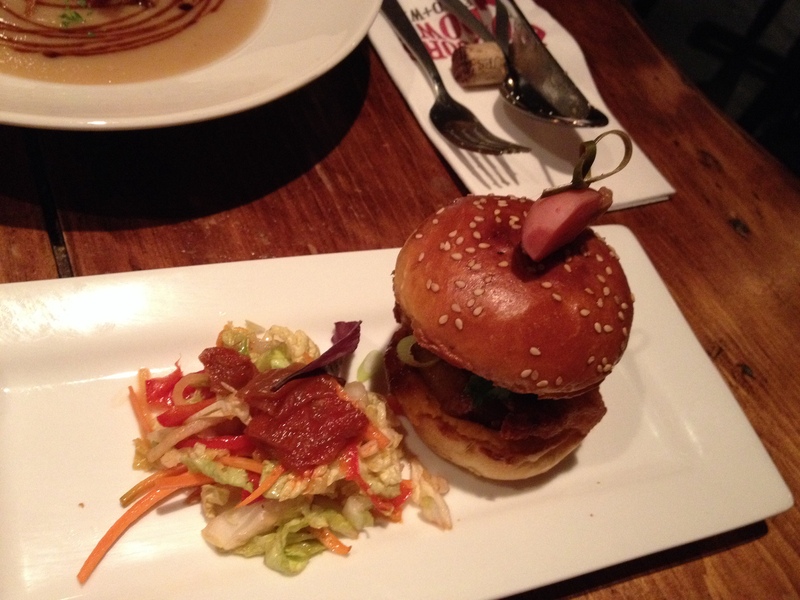 The Korean Pork Belly Slider was stacked high with mouthwatering pork belly, sesame ginger sauce and kimchi hummus. Neither Erin nor I were huge fans of the kimchi hummus, it had a weird texture, but the daikon slaw that accompanied the little nugget of porky love was delectable. 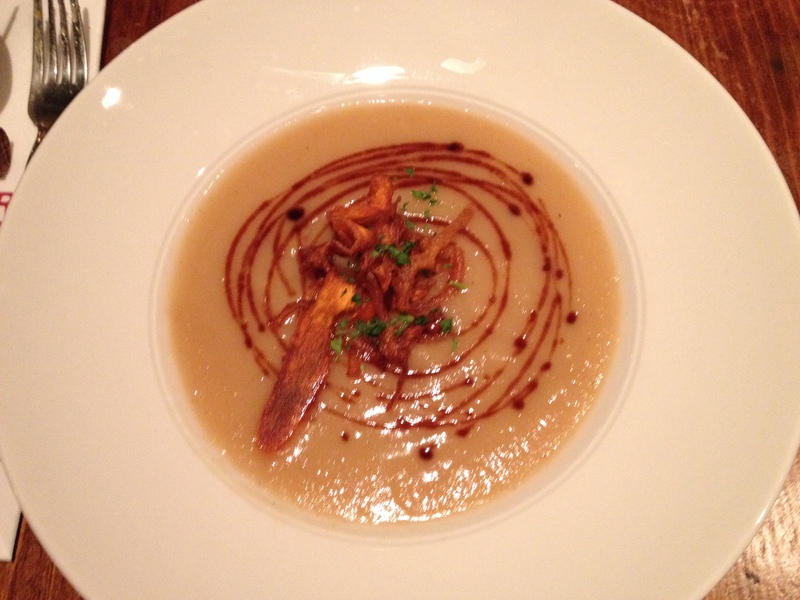 Erin’s second dish was the Farmer’s Market Soup that is a weekly inspiration of seasonal vegetables. The soup for the evening was parsnip and butternut squash puree and it was oh so yummy. The swirl of maple and balsamic reduction was the icing on the cake and really made this soup great. It was amazing soup, enough said. For my entree, I chose the Smoked N.S. Pork Chop. 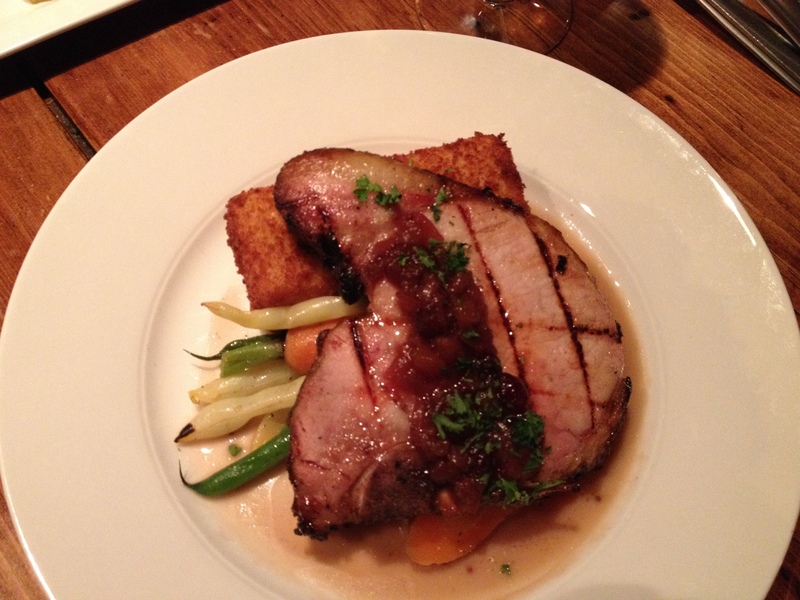 This, my friends, is not your mama’s pork chop. It was huge! Cooked perfectly, a little pink and just the way it’s supposed to be, and served with the most delicious cran-apple chutney. And the side dish, OH MY, the side dish. Fried Macaroni n’ Cheese. Yes that’s right, a huge brick of cheesy, greasy, heart warming fried mac n’ cheese. A combination of two of my favourite things, deep fried and mac n’ cheese. I have ordered this dish before at other establishments, and the dried up nuggets of undercooked noodles are nothing in comparison. It was beyond amazing. Though I had barely recovered from my foodgasmic fried macaroni n’ cheese, we ordered dessert. 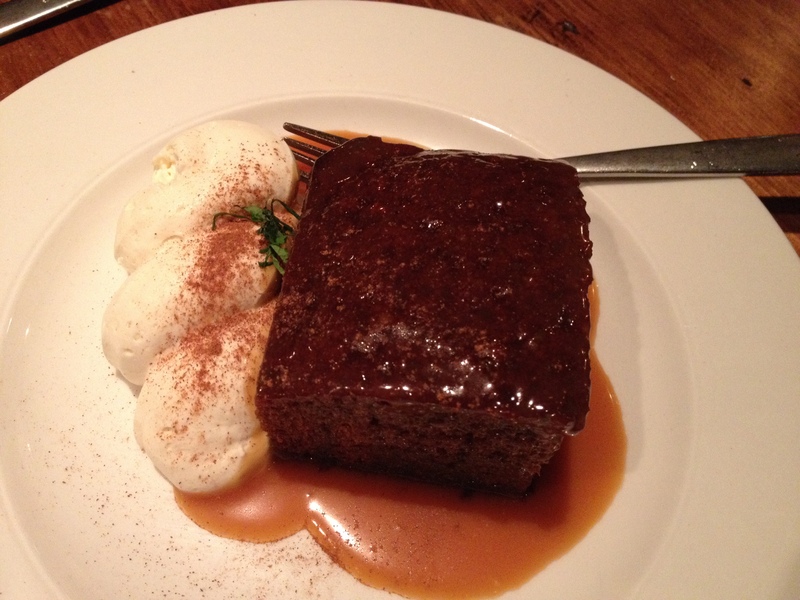 We chose the Warm Gingerbread with Caramel Sauce. A classic comfort food, it warmed my belly despite the huge meal that we had just eaten. So good. The meal was delicious, the service was great, and we were both very happy. The only thing that bothered me were the wine portions. Though the wine list is extensive and emphasizes the local, when Steve asked us if we wanted a big glass of wine, I didn’t realize that I was automatically getting the pricier 8 ounce glass and not the 5 ounce glass, I thought he was just being funny. He probably could have been more clear about it considering there is at least a 5$/glass difference between the two sizes of house wine. Overall, I highly recommend 2 Doors Down. A cheaper option for the Chives aficionado and a great atmosphere that anyone will enjoy. The next time you are on Barrington, Eat. Explore. Repeat. at 2 Doors Down. Bon Appetit! Cost: We split the bill down the middle and it was 75$ for myself including tip, a little pricey for casual date night, but a great place to take the parents or for a night out with friends. Things I liked: The decor, the great service, and that darned fried macaroni n’ cheese: I’m still dreaming about it. Things I didn’t: The deceiving glasses of wine. Best Place to Sit: In the window with a view of Barrington Street, or at the bar to have a grand ol’ chat with Steve the bartender. What To Order Next Time: BRUNCH! 2 Doors Down started serving brunch this past weekend, CAN’T WAIT to try it! Wow. A brick of mac n cheese. I can’t decide if that’s obscene or genius. I can’t say I’ve ever been eating a bowl of mac and thought, y’know what this dish needs? To be packed together, crumbed and deep fried!